This shoot was arranged to benefit Rebecca, our model, and also Keli, the rather unassuming and very talented makeup artist. Rebecca was looking to do something a little different to broaden the appeal of her portfolio, whilst Keli had a specific idea she wanted to try. Here, I had free reign, so I could decide what the important elements are in the composition, and I could design the lighting to manipulate the initial perception of the image. The rather dramatic headdress was obviously going to be an important factor, along with Rebecca’s face. I decided to use a technique that was based on the Chiaroscuro portrait lighting technique, with some slight amends. I didn’t want such a harsh drop off of the light to Rebecca’s far side of her face, as that would also cause a loss of detail to the headdress from this particular angle. Okay, lets get to the lighting. The key light is an Elinchrom BRX500Ri to my immediate (frame) left, firing through a large honeycombed softbox (40×53 inches) with an output of 5.0. The box was orientated vertically to give good coverage from foot to head initially. I had an Elinchrom ELB400 frame right, and slightly further back than Rebecca. It was firing through a 30x140cm honeycombed stripbox at an output of 4.0. This was set so as the light would skim across the feathers of the headdress, emphasising the texture and shape of the feathers. Due to the paper thin nature of the feathers, it only took a couple of inches of movement in the wrong direction for the light to fail to skim correctly, and all texture was lost. 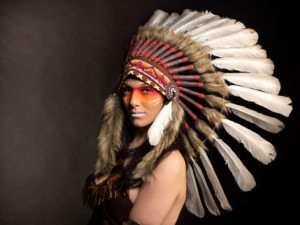 I was relying on the emphasis of the texture and shape of the headdress to initially catch the eye of the observer, with the converging fan design drawing their eye to Rebecca’s face. The key light was raised a little after the initial test images, so as the focus of the light could be seen on Rebecca’s face, and there was a discernable drop off towards her feet. This again helped draw the observer’s eye to her face. Right, the background light. The background is a black paper roll, and I used an ELB400 with an EL adaptor to make use of a high intensity 65° reflector and grid at an output of 5.0. The head and reflector is frame left, and just aimed at the backdrop behind Rebecca. This particular image needed tighter control of the light for Rebecca’s face. If I used the same large softbox, it would easily have filled the feathers, killing any shadows amongst the ribs of the feathers that creates and defines the texture and shape. I switched the key light to a 40cm gridded beauty dish, still fitted to the Elinchrom BRX500, and moved it much closer and to my (frame) right. The pool of light from the beauty dish was restricted to Rebecca’s face and also onto the beaded headband. The output was reduced to 3.0. I still used the ELB400 frame right to skim across the feathers, again paying close attention to the angle so as to maximise the detail and texture. Output was slightly lower at 3.5 as it was nearer and a little higher, angled slightly downward. The background light has been swapped from the high intensity reflector to another honeycombed 30x140cm stripbox, and the ELB400 was firing at 5.0. I had to take a couple of test shots till I was happy the fall off happened just behind Rebecca, so the background frame right went to absolute black. The lighting technique shown here isn’t particularly difficult, although choosing the right modifier and lighting control can make a huge difference to the realisation of your concept. Rebecca is based near Wakefield and will travel. She can be contacted via her facebook page here. Keli can be contacted via her facebook page here.